In this genre of Blues, one of the significant instruments used to convey the emotions, both happy and sad, is the harmonica. It has been called many things…moothie, if you’re from Scotland; gob-iron if you’re Ian Gillan; in jokes it is usually referenced to my sister or more commonly ‘Our Monica’; most commonly, and confusingly to non-cognoscenti it is called the harp. Yet it bears no resemblance to that rather large stringed instrument and it is devilishly difficult to master, even though it theoretically cannot be that difficult…after all, you stick it in your mouth and blow! Having tried to play the damned thing, I can vouch for the difficulty, not in making a noise, but making a coherent and musical noise which proved beyond my limited talent. Some players seem only to be able to make it scream…the truly talented ones make the humble harp into a voice of its own…able to express every feeling and nuance the song demands. That is a long-winded way of introducing Dutch blues vocalist and harp player Pieter “Big Pete” van der Pluijm who is a player of the latter variety and can make the harp talk and sing as well as own voice. If you haven’t heard of him yet, I would recommend you seek out his past works with bands such as The Strikes, The Backbones or the more avant-garde and modestly named, M.O.C.T. (Men Of Considerable Taste). He’s currently busy with his own Big Pete Blues Band performing around Europe at many of the big blues festivals. 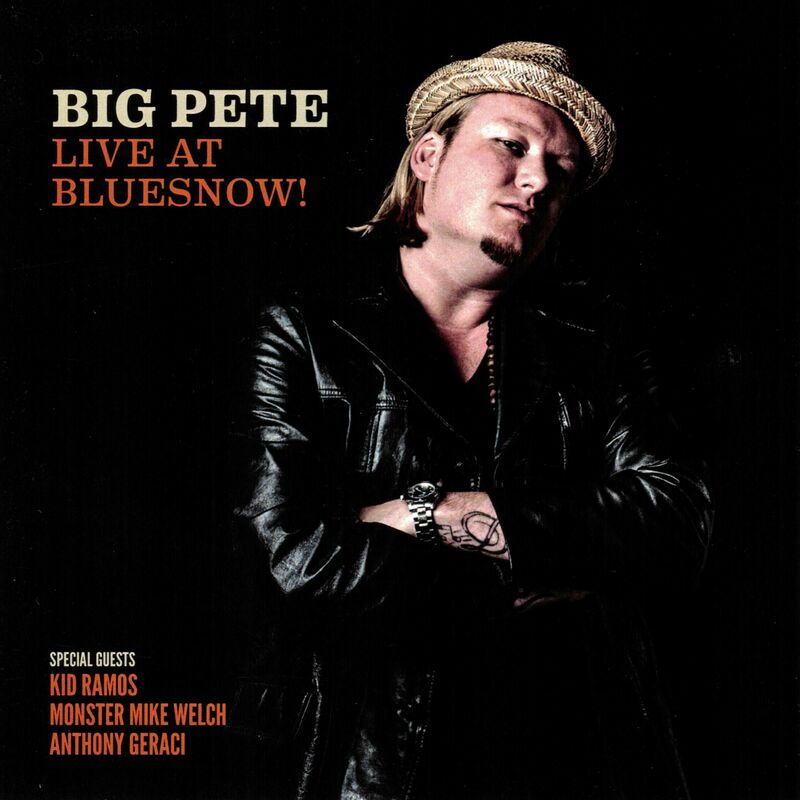 His last release, Live at BluesNow! shows his talents to the full in this live setting and, backed by a solid and capable band and a couple of guests, runs through eleven songs mixing originals and covers. Opening with a Big Pete original, Mean starts with a great harp refrain as it moves into a standard blues pattern with a Three Dog Night feel to the guitar. Pete’s vocal range is good too and he doesn’t hog the limelight…as evidenced by the tasty guitar solo here. When he has his harp solo, he shows how to put sensitivity and depth into the melody. Blues shuffle, Born To Die, is introduced with a guitar and harp duet in another familiar yet original blues style. The harp solo illustrates how they don’t all have to sound the same as he injects different techniques to give it variation and feel. He pays tribute to Junior Wells next, as the band take on the classic Come On In This House and give it a nice reading by keeping it close but without copying the original. The guitar runs behind the harp are a highlight in their subtlety and dexterity and the solo is tremendous. Next up is a song by the multi-instrumentalist Boyd Small (check his More Love and Trouble album for more); This Time No Lies is a slowish blues played with some real feeling and a quiet and quite lovely harp solo. After introducing the band, Pete brings Mike Welch on board for the Kooiman tune, 6:45. Welch is allowed plenty of room to shine, as we know he can, on guitar and Pete concentrates on the vocals. He brings the next guest on for I’ve Got My Eyes On You…Anthony Geraci adds some great piano to this song that Pete first recorded on his Choice Cuts release. Here it is brought to life as the whole band get behind him as he sings up a storm and plays a short and brilliant solo. Then it’s straight into the slow blues of Ball And Chain. This is a quality track as each band member adds such deft touches behind the vocals. The Hammond solo is actually different to most and brings an added feel to the song. Just To Be With You is back to harp driven and the blues riff behind the whole thing is a delight. The harp solo again shows how it should be done….just feeling and no overblown (pun intended) histrionics. Only Time Will Tell is the band doing a brave thing as Pete explains that they had only heard this Geraci composition on the day. You wouldn’t think so as they put a jaunty backing to the melody and a neat guitar solo makes it work very well. Rockin’ Daddy welcomes Kid Ramos onto the stage to add his distinct style to this bluesy rock number and his solo is superb. The closing track, My Backscratcher, is the encore and has become my favourite because of the guitar/harp interplay is just great listening and it builds into a mid-paced blues of classic construction but a modern execution. This is a great showcase for Big Pete who shows all of his skill as a composer, singer and harp player but, importantly, he allows the whole band the time and space to express themselves and the whole thing benefits from this ensemble approach. There isn’t a bad song here and, although the pace doesn’t vary that much, it will have worked fine in the live setting. A damn good album that is a welcome addition to my ‘harpers bizarre’ collection of CDs.